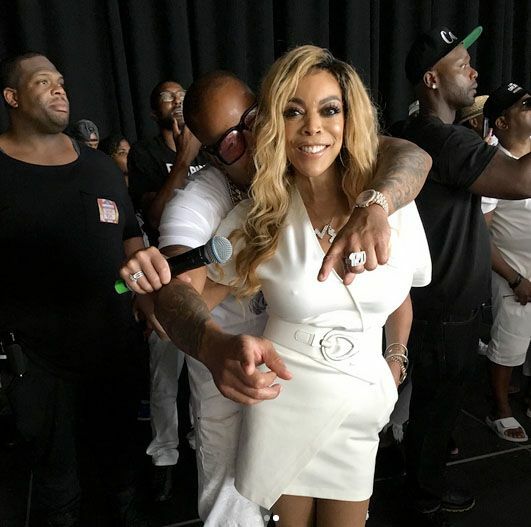 Wendy Williams’ husband Kevin Hunter is doing the most. In September news broke that 46-yer-old Kevin was leading a double life with 32-year-old massage therapist Sharina Hudson. And has been doing so for the last 10 years. Mind you, Wendy and Kevin have been married 20 years after tying the knot in 1997. It was reported Kevin moved Sharina into a $765,000 house that’s nine miles away from his home with Wendy and their son Kevin Jr. Kevin and Sharina were first spotted together just days after he and Wendy returned from a BAEcay in Barbados. Now, the secret couple has been spotted together again. The DailyMail was on their heels and got pictures of Kevin picking Sharina up in his red Bentley SUV in NYC on Monday (November 6th). Peep the pics here. Not long after it was revealed that Kevin had this secret relationship going on, the 53-year-old daytime talk show addressed the cheating rumors. We’d like to note, she was still wearing her wedding ring. Hmm…we wonder how long she’s going to “ride or die” for her man with these pictures continuing to pop up. Time will tell….